Caribbean Stud is available at just about every real money casino on the Web. Digital versions have proved extremely popular with gamblers all over the world, due in no small part to the game’s signature progressive jackpot feature. As a table game with straightforward rules and big rewards, Caribbean Stud poker seems like a perfect candidate for live dealer gambling. The aim of online Caribbean poker is to draw a stronger five-card hand than the dealer. Each round starts with an ante bet, which must be made in order to join the game. Once the antes are up, each player is dealt five cards face down. The dealer also takes five cards, the last of which is turned face up. Where can I play Live Dealer Caribbean Stud online? 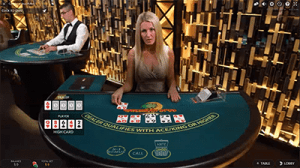 The team at OnlineCasinoWebsites.com have scoured the Net for live Caribbean Stud poker games and found the best version is powered by premium live dealer gaming software studio Evolution Gaming. Check out any of the sites listed in the table at the top of this page (geo-targeted to your location to only display online casino sites accepting players from your country) to jump into Evo Gaming’s Live Caribbean Stud Poker.